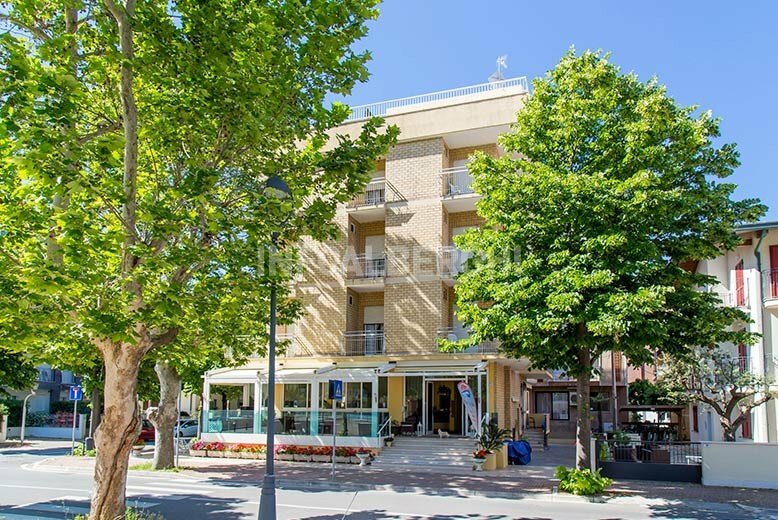 The Hotel Maxim , 1 star of Misano Adriatico, is ideal especially for families with children thanks to the many dedicated services, including enclosed parking, renovated rooms, special menus for children and for celiacs. Admits small pets. The Maxim is located in the first parallel of the seafront of Misano Adriatico, a stone's throw from the beach. In a few minutes you reach the Aquarium of Cattolica and the picturesque port of Portoverde. Nearby, also the train station and the center of Misano. The hotel rooms have been recently renovated and have a balcony, sea view, ceiling fan, digital LCD TV, WI-FI, orthopedic mattresses, private bathroom with shower, hairdryer, terry towels and complimentary toiletries. At guests' disposal: bicycles, open-air porch with tables and chairs, newspapers, bar, lift, air conditioned dining room, gym with solarium on the 4th floor with sea view, safekeeping service. PARKING: covered and free for all guests. WI-FI: in the common areas and in the rooms. PETS: small pets are allowed (up to 2 kg). BREAKFAST: rich buffet with croissants, cakes, plumcakes, homemade pies and ring-shaped cake, fresh fruit, coffee, juice, yogurt, cereals, cold cuts and much more. LUNCH AND DINNER: the best dishes of the Romagna tradition are offered with a double menu of meat and fish, homemade desserts and a buffet of vegetables and appetizers. VARIATIONS: the kitchen prepares special menus on request, both for children and for those suffering from celiac disease and other intolerances. Vegan cuisine on request, vegetarian dishes available. In the hotel: outdoor playground area, bicycle seats, bottle warmers, strollers and dedicated TV channels. In the room: cots or beds with the sides. At the restaurant: high chairs, special menus on request, special dishes, broths, vegetable soups and possibility to have meals at flexible times. On the beach: live entertainment and area equipped with games. The affiliated beach Bagni Giovanni 58 is just a few meters from the hotel, in addition to the rental of sunbeds and beach umbrella, the hotel guests will have at their disposal playgrounds, entertainment service, showers and playground area for children. Prices are per day per person for a minimum of 3 days. In the All Inclusive formula the minimum stay is 5 days. TOURIST TAX: excluded. € 0.60 per day per person for a maximum of 7 consecutive nights, excluding children up to 14 years. FAMILY PLAN: 2 adults + 2 children in the same room pay 3 full rates. At Misano Adriatico there will be the Giuseppe Filippini Trophy for figure skating. At Misano Adriatico there will be the Giorgio Perinetti Memorial Trophy for figure skating.